Rocket Internet-incubated Indian fashion and lifestyle venture Jabong has become the top money losing initiative for the German emerging markets and Europe focused internet company. Jabong's operating loss margin rose far ahead of Southeast Asian lifestyle e-commerce firm Lazada and Latin American e-commerce marketplace Linio in the first quarter of 2015, making it the most operating loss making property among Rocket Internet's top ventures. Last year, in the same quarter Lazada sported the biggest EBITDA (earnings before interest tax and depreciation and amortisation) loss margin with Jabong and Linio being neck to neck, as per data shared by Rocket Internet (see graph). 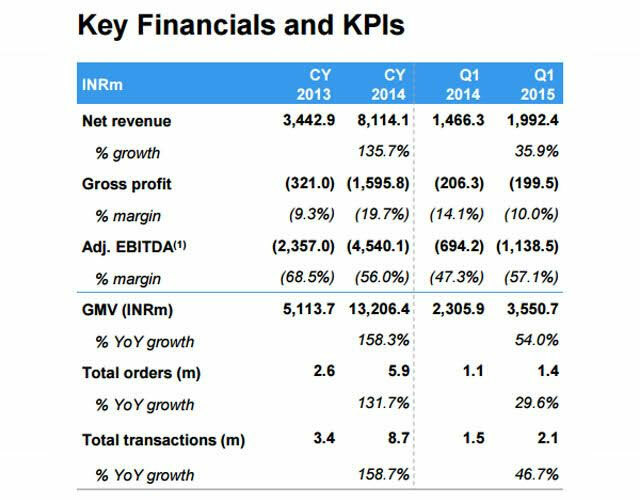 Jabong also happens to be only the second key venture of Rocket Internet besides home24, that saw deterioration in operating margins compared with Q1 2014. Meanwhile, Jabong has also been trailing other global 'proven winners' of Rocket Internet in terms of growth of net revenues or the actual revenue booked by the companies (gross merchandise value or GMV also captures sales from third-party sellers where Jabong only gets a listing fee). It was also the only top venture sporting under 50 per cent revenue growth in Q1, besides Brazilian lifestyle e-tailer Dafiti. Jabong, which competes with Flipkart-controlled Myntra among others in the lifestyle e-commerce space in India, also saw its operating loss margin rise compared with its full calendar year 2014 numbers. It had EBITDA loss margin of (-) 56 per cent last year, an improvement from 2013 when it posted (-) 68.5 per cent. This possibly signals how the firm is trying to push its sales faster with more discounting. This could also possibly reflect net revenues are failing to keep pace with operating expenses. Operating or EBITDA losses capture what a firm loses from its operations or day-to-day business activity factoring out other aspects like interest on loans (including working capital) and depreciation or accounting for loss of value of assets through wear and tear. EBITDA margin refers to EBITDA as a percentage of revenues. Notably, Jabong's third party marketplace sales growth has been faster than what it books on its direct sales to consumers. This is a continuation of a previous trend (click here ) where GMV (and transactions) growth has been higher than that of net revenues (or value of orders served directly). Also the average selling price of third-party vendors appears to be around 15 per cent higher than that of what Jabong direct e-tails to the customers. The average transaction value (including what it sells directly and products sold by other merchants) in Q1 stood at Rs 1,690 compared with a tad over Rs 1,500 in Q1 2014 and for full calendar year 2014. In the same period, average basket value of products sold directly by Jabong has risen marginally to around Rs 1,423. Third party vendors now represent around one in three transactions on Jabong every day. Meanwhile, Jabong was valued at around $480 million as of last December in its last funding round, according to Rocket Internet's annual report. This means the firm was valued at around Rs 3,050 crore or 2.3 times its GMV for the year. Jabong.com Xerion Retail Pvt. Ltd.